Situated in Plymouth, the National Trust owned country house, Saltram House, is a Georgian mansion surrounded by stunning parkland and pretty gardens. However, it is also reportedly home to some unwanted ghostly guests. 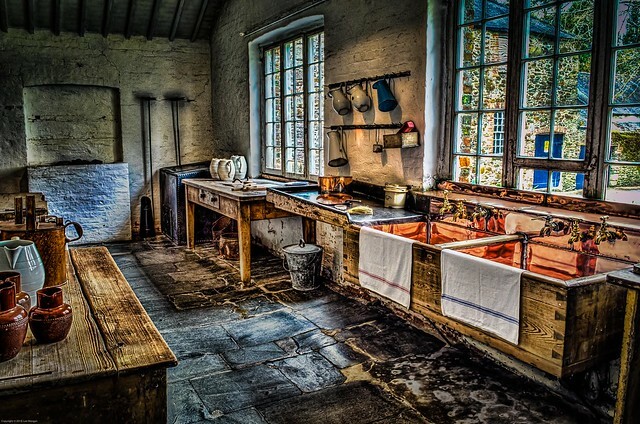 Rumour has it a maid was gruesomely murdered in the kitchens and her presence is still around in the form of a hooded dark figure who roams the corridors and dining room. The 11th century Chambercombe Manor, originally home to the Champernon family, is reported to be haunted by a woman who sought refuge after suffering injuries in a shipwreck on the coast at Hele. With hopes of recovery, she was holed up in the manor but unfortunately passed away. Years later, the manor’s residents stumbled upon a concealed chamber and discovered the woman’s skeleton on the four-poster bed. The residents stole the jewellery from the body before bricking the room up again. As seen on Most Haunted, the cradle in the chamber has been documented to move on its own and a ghostly face has been photographed too. The manor hold paranormal events for adults only from October to December; for more information on times and prices, visit the website. Tall granite walls are the foundations of this 13th century, 5-star hotel, where Sidney Godolphin, a poet and soldier, was taken to heal after being wounded in a battle in Shimish in 1643. Some visitors, while walking the corridors of this hotel, have been supposedly spooked by his ghost who wears his soldier’s uniform as he wanders down the halls and walks through walls. One of the largest castle ruins in the South West, and the largest in Devon, and set on a secluded wooden spur, is the formidable Okehampton Castle with plenty of ghostly goings-on to speak of. The ghost of Lady Howard is said to reside at the castle that has become infamous with locals. Howard became well known for her killing spree in which she slaughtered her four husbands and legend has it that ever since her passing, every night at midnight she travels from Okehampton to Tavistock and back in a carriage made of bones that’s driven by a headless driver. Lady Howard punishes herself by picking one strand of grass from the hill and then returning home again; it is only once the hill is stripped completely bare of its grass that she will have her punishment lifted. 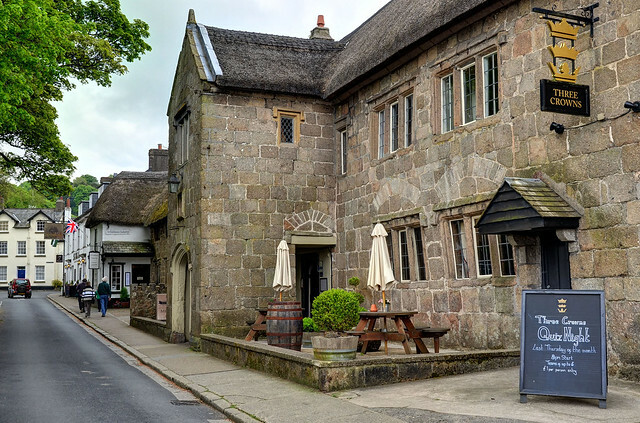 Based a mile from Brixham harbour is the paranormal hotspot Churston Court Inn, a 12th century inn that is reported to be haunted by groups of monks. Patrons have spotted these monks blowing out candles in the dining rooms late at night. Surrounded by breathtaking countryside south of Exeter is the historical Powderham Castle. Since its building in 1391, the Courtenay family have owned the estate and the vast history that comes with it. The Guard Tower of Powderham Castle is where workmen found bones that belonged to a woman and a baby; however the remains of the bodies have still not been identified to this day. There is another ghost that roams the grounds of the castle, she is known as the “grey lady”, she walks to and from the castle and the church. When in the library she leaves a cold chill in the air which awakens guests there. Nestled in a fairytale valley are the 15th century “romantic ruins” of Berry Pomeroy Castle which is said to be haunted by two ladies: the ‘white’ and the ‘blue.’ The ‘white’ lady rises from St Margaret’s Tower and haunts the dark dungeons where she was starved to death there. 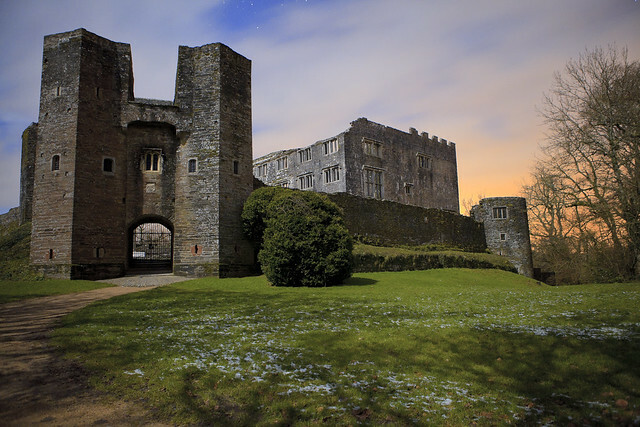 Another ghostly lodger at the Berry Pomeroy Castle is the ‘blue’ lady who is known to lure people into the ruin; the back story is that she had a rough relationship with her father which resulted in her retreating to the castle and never leaving. 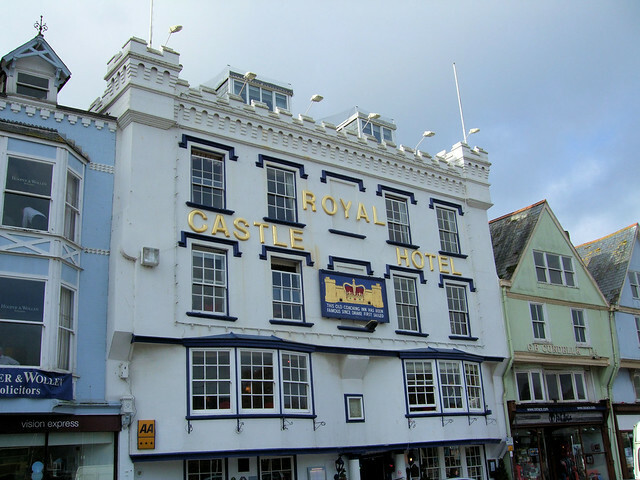 Sitting on the River Dart is the The Royal Castle Hotel, a 17th century inn with plenty of paranormal happenings. At midnight, guests have heard horse hooves scraping against the cobbled floors and a carriage door being closed; once silence befalls the hotel all that is left is the crack of a whip, the chime of the clock and the phantom coach departs. It all started in 1688 when William and Queen Mary started their journey from the Netherlands to England; the Queen made it to Dartmouth but William didn’t, he ended up in Torbay due to the storm. A coach came to collect Mary to reunite her with William and has done every day since. 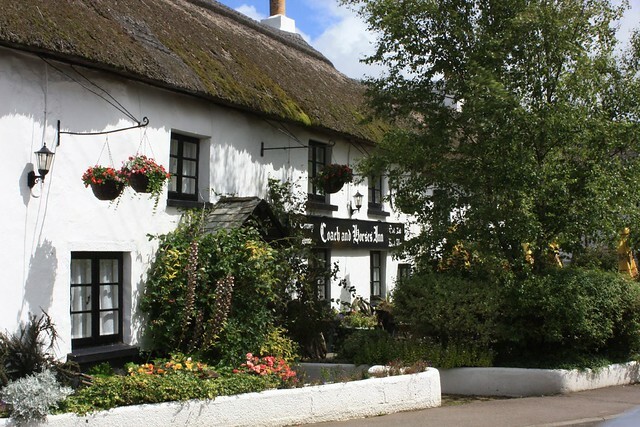 Based in north Devon is the Coach and Horses, a 13th century inn rife with tales of ghostly happenings. At one point the inn was used as a court room with a hook used to hang guilty criminals, and the criminals can sometimes be seen swinging by the neck. Other sightings include cavaliers standing in the corner of the room and a ghastly lady in black floating along one of the corridors. At the heart of Buckland Abbey, Drake’s drum can be found. Back in the 16th century, Sir Francis Drake purchased the abbey to renovate it. The process reportedly took only three nights to finish because he summoned the devil to help out! As punishment for this sacrilegious invocation, Drake is damned to wait until dark each night to drive a black hearse through Dartmoor while being followed by a pack of screaming hounds – all coming after the souls of unbaptised children. He is said to be manifesting in ghost form in his drum which still remains in the abbey and reportedly sounds whenever England is in danger. 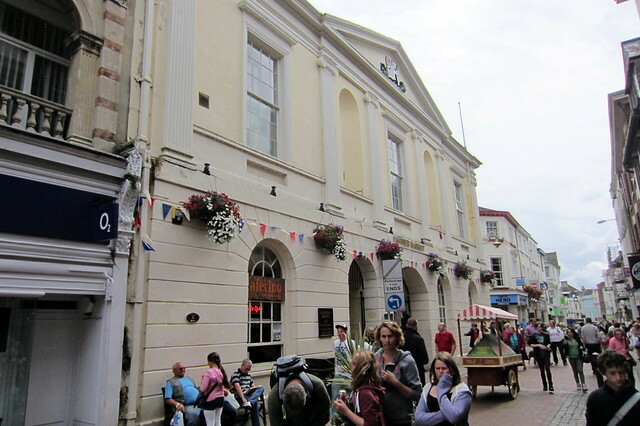 During the early 2000s, several visitors to the cinema in Barnstaple reported sightings of a ghostly gentleman that is believed to be a worker who fell while repairing the roof in the early 1930s… and died a week later. The Guildhall was built in 1826 and is home to a ghostly double act by the names of Ken Mucay and Bob Justy, both in their fifties whose mysterious deaths still remain unknown.